Depending on one's sexual orientation, meeting online may be the first - or second - most common way to meet. And these relationships may be leading to greater diversity as well as longevity: marriages forged in online relationships may last longer. Loose ties have traditionally played a key role in meeting partners. Most people date people linked with their group of friends. Dating partners were embedded in each other’s networks. 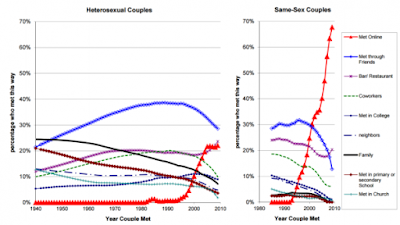 (But) today, online dating is the second most common way for heterosexual couples to meet. For homosexuals, it is the most popular. 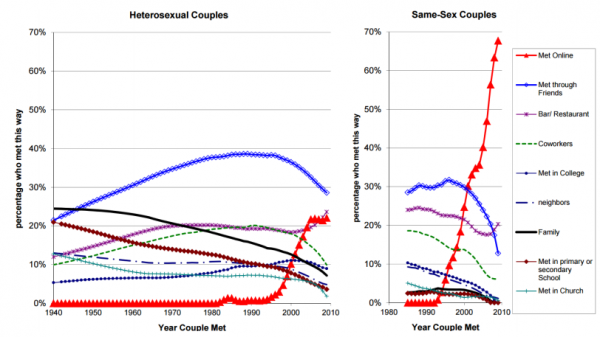 More than one-third of marriages start online. Married couples who meet online have lower rates of marital breakup. This is (also) influencing rising levels of interracial marriage. Match.com went live in 1995. A new wave of dating websites, such as OKCupid, emerged in the early 2000s. And the 2012 arrival of Tinder changed dating even further. Today, more than one-third of marriages start online.Clearly, these sites have had a huge impact on dating behavior. But now the first evidence is emerging that their effect is much more profound. The article you have shared here very awesome. I really like and appreciate your work. I read deeply your article, the points you have mentioned in this article are useful for me. Thanks!